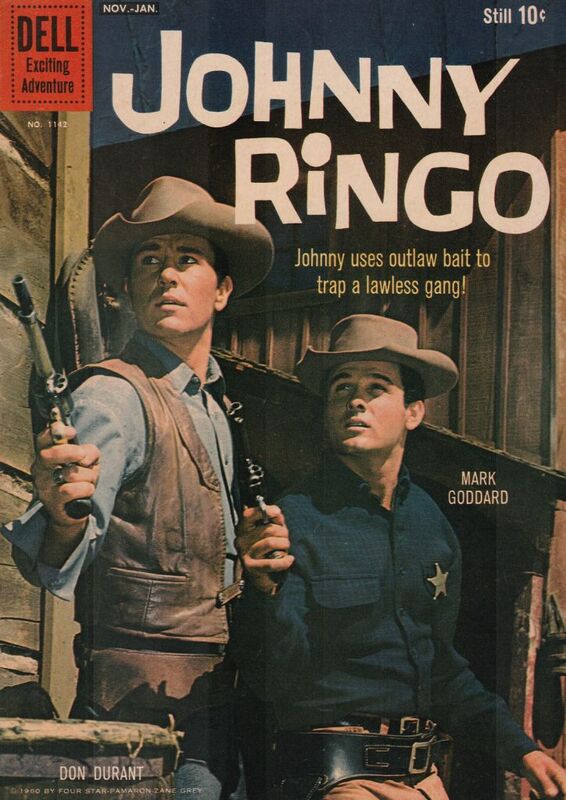 "Johnny Ringo" starring Don Durant aired only one season on CBS, 10/1/59 to 6/30/60 (38 episodes) on Thursday nights from 8:30-9pm ET, but is fondly remembered by TV western fans. A pilot for the series, "Man Alone", actually aired March 5, 1959, on "Zane Grey Theatre". When the show went to series all but an opening scene with Durant and Roy Barcroft was recast and reshot, although the scripts are the same. Gunslinger Ringo becomes sheriff in the town of Velardi, AZ, vowing to live down his violent past. He gained a deputy in the second episode, Culley (Mark Goddard), a former trick shot artist. Love interest was supplied by Karen Sharpe as Laura Thomas. Her father, a reformed alcoholic, Case Thomas (Terrence DeMarney), was at first a deputy then a storekeeper. Case was killed in the 24th episode, "Border Town." Ringo carried a Le Mat Special, a custom made six shooter with a separate cylinder that fired a shotgun shell, sometimes referred to as his "seven shooter". A fine singer, Durant wrote and sang the memorable title song. Don Durant and Karen SharpeAlthough a terrific western under producer Aaron Spelling, the series faced stiff competition from "Staccato" on NBC and the very popular "Real McCoys" on ABC. When the series ended, Durant successfully put his efforts into real estate, eventually developing Lago de Palmas in Palm Desert. Durant was a big hit appearing with his Le Mat at the Charlotte Film Festival a few years ago. He died at 72 in Monarch Beach, CA, of lymphocytic leukemia and lymphoma which caused cardio-pulmonary failure on March 15, 2005. Karen Sharpe gave up acting in �66 to marry producer/director Stanley Kramer. She and Durant reunited for the first time in years at Jim Roberts' �96 Pre-Golden Boot party.